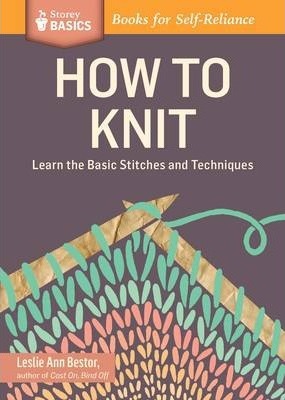 This title comes with simple, fully illustrated instructions that lead you step by step through the basics of knitting, from choosing the right needles and yarn to reading a knitting pattern, casting on, executing knit and purl stitches, binding off, seaming, and blocking finished projects. You'll also learn techniques for increasing, decreasing, and repairing mistakes. Even if you've never held a pair of knitting needles before, this easy-to-follow guide will have you knitting in no time! With more than 30 years of knitting experience, Leslie Ann Bestor is the expert and friend who will teach you how to knit. She leads you smoothly down the knitting path by carefully explaining the tools you need, how to cast on and bind off, how to knit and purl, how to shape using decreases and increases, and how to correct your mistakes. With these basic skills mastered and a handful of simple scarf patterns to practice on, your knitting success is assured. So pick up your needles and yarn -- it's time to get started! Leslie Ann Bestor is the author of How to Knit and the best-selling book, Cast On, Bind Off. She is a knitting teacher and store manager at WEBS, America's Yarn Store, and her designs have been featured in books and magazines. She lives in Amherst, Massachusetts.